On which Majesty’s Secret Service? Raymond (the Turk) Westerling had a license to kill during the 1947 counter-insurgency operation in South-Celebes during the Indonesian war of independence. The Dutch government gave him carte blanche to restore ‘law and order’. Did the British issue him a License to Kill unarmed civilians too? As part of the open source research project dutchwarcrimes.com a witness recently has been interviewed who insists that Captain Westerling and his unit were wearing uniforms of the British Army while randomly executing unarmed civilians at a Jakarta food market in October 1945. That is to say, more than a year before the bloody campaign in Celebes started and at a moment that no Dutch troops were on the island of Java. Or were there? Witness Iwan Leendert Dompig (89) served in the Dutch-Indies, Australia and Korea. This Suriname Dutchman is a real war veteran. Dompig wasn’t even twenty years old as he signed up for the army. The military slogan: ‘Sign up and see the World’ appealed to him. 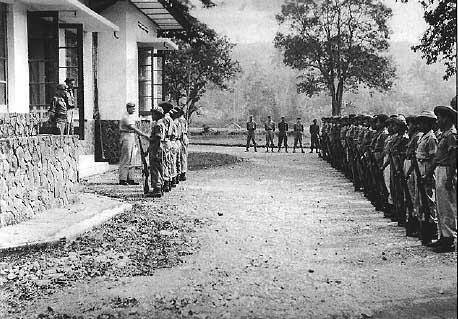 As the Japanese unconditionally surrendered August 15th 1945, pa Dompig and his fellows were transferred by the British from Balikpapan (Borneo) to Jakarta (Java). Q- But those four strong guys on the Indonesian market, they were shot by Westerling? Q- That seemed to be nice, going to the market? A- He even told me, “that guy who is there is a villain. Haven’t you heard about Westerling?” I did hear some rumours and now I was in the infantry. Q- Westerling was already notorious, even before he went to Celebes? A- Of course! Those things came later. What I am talking about still happened in 1945. Q- Have you seen more misdeeds committed by Westerling? Besides the four he shot? The only thing I tell you I saw that Sunday morning with Cameron. That is what I witnessed myself. All the other things he did all came from hear say. The Moluccans got those boys and took them down… from the street. He comes out and peng peng peng. A- I told Cameron, let us leave. Because I had my Tommy gun with me. Q- You were armed and could have shot him? A- I would because I could not sustain the sight any longer. One, two, okay. But after four …. Q- But Westerling ordered those Moluccans wearing British uniforms to take those four guys? A- No, not directly in one group . One by one, as they were passing by. So, one came along. A good solid guy, and then: “Must be a spy”. Q- Must be a spy? Q- He says, “That’s a spy.” But he doesn’t know? A- Well, that is what he tells his friends. Q- But the moment they found such a strong young boy, they decided he was a spy. And then he was shot? A- With a gun. His revolver, a .45. That is 15 millimeters. Q- And you saw that . I mean, fortunately I never saw anything like that. What did you feel? A- I felt nothing. I’ve seen so many things. In Balikpapan with the Japanese…..when you see these things…. you feel nothing. You just feel petty for that boy. Q- But you had your Tommy gun and you were upset and actually wanted to kill Westerling. Q- So, he shot one dead. Then after that strong guy came a few not so strong guys or grandmothers. And they could simply pass. Then when another strong boy walked along they shot him dead. A- The moment anyone passed by Westerling did not like, he had him picked up. Q- Had him picked up? He points to him and indicates that is the one he wanted? A- They came in groups with women an so……. I have witnessed four…. Q- When those four men were dead you went. Do you think he continued to shoot people? Q- It could have been ten killed also? A- I talk only about what I saw. Q- It happened at a market and just by chance you were on the same spot. They just left the dead behind? A- The next one must remove the body to the back. I mean, that’s …. and then they get even awards . Look , in a war nothing is sad. You have no feelings. Westerling congratulates 5 commando's qualified as the best in their        training course. Kalibata, circa 1947. What we know about British involvement. The British trained Westerling and July 1942 he absolved his commando training from the Commando Basic Training Center in Achnacarry, Scotland. After his promotion to corporal, he became the instructor for “Unarmed Combat” and “Silent Killing” with No. 2 Dutch Troop 10th Inter-Allied Commando. Within less than a year, Westerling became the instructor for the entire 10th Commando and also instructed “Toughness Training”. At his request he left the British Commando staff position and, on December 1943, joined his old No. 2 Dutch Troop in India for Operation Burma. In Ceylon he underwent jungle training, a valuable asset for future assignments. To his big disappointment, Westerling was never sent to the front line. Westerling first came to Indonesia in September 1945, landing in Medan, North Sumatra. Why Westerling was promoted Captain? Years ago witness and war veteran Dompig contacted different Dutch media. He, Cameron and others wanted to tell their stories. Nobody was interested in what they had to say about Westerling nor anything else. On which Majesty’s Secret Service Westerling killed in 1945? 9. Van onze A.D.C.S.x is alleen nog Lt.Westerling hier. Hij werkt voor de Eng. als field security officer” en is een van de weinigen die nuttig werkdoet bij het arresteeren van rampokkers, het opsporen en bevrijden van gekidnapten enz., uiterst gevaarlijk werk, waarbij hij reeds tweemaal, alhoewel licht, werd gewond. Het is mij niet recht duidelijk waarom de Engelschen een Ned.onderdaan wenschen te gebruiken, terwijl zij toch even geschikte menschen bezitten vooral omdat Westerling evenmin taal of land kent. Om de Eng. niet onnoodig te ontstemmen is het waarschijnlijk beter hem daar te laten, maar dan vind ik dat hem den kapiteinsrang moest worden gegeven omdat hij moet samenwerken met jongere en minder ervaren Eng. officieren, allen van hoogeren rang. Posted on December 2, 2013 by 7mei.nl. Bookmark the permalink.